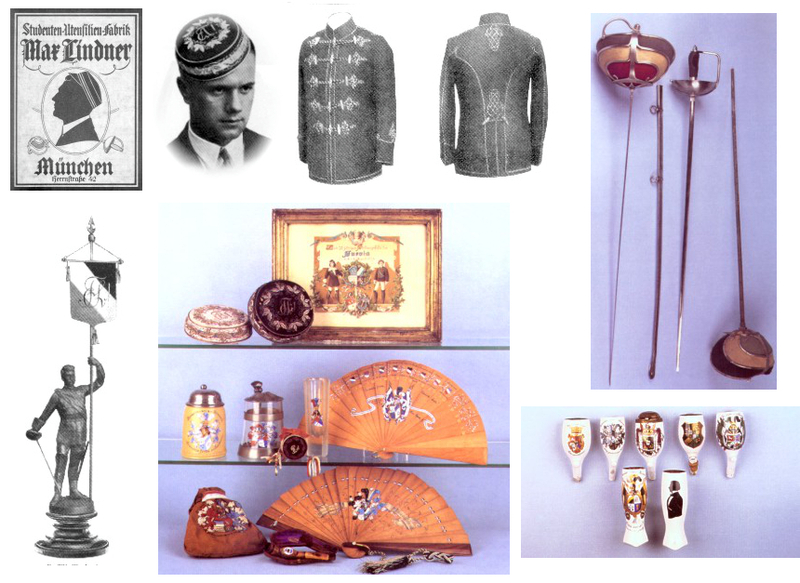 Studentica – regalia, insignia, trappings, emblems. Members of German student associations surrounded themselves with the symbols of their fraternities. 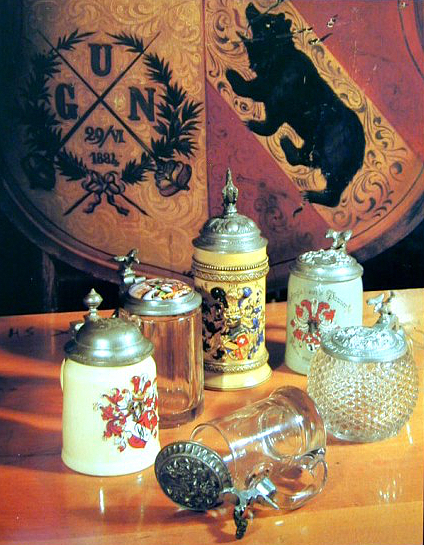 Zirkels and Wappen adorned a wide variety of clothing, furniture, books and other articles of everyday life, including, thankfully, beer steins. Max Lindner of Herrnstrasse 42, München, provided personalized articles to fill every students need, and probably many they would not have thought of themselves. Caps and jackets were available in fraternity colors. Fencing swords, face guards, goggles, boots and pads were available for the dueling societies. Rings, cuff links, tie pins, letter openers, spoons, wallets, leather portfolios, banners, pillows and ribbons were available with the association crest, colors, or Zirkel. Painted porcelain inserts bearing the student crests were made for wood-framed mirrors, chairs, tables, clocks, tobacco humidors, cigar boxes and other wooden articles. Fine china dishes and tea sets bore the coats-of-arms just as they did for royalty. In glassware there were wine glasses of all types, liquor decanters, beakers, ashtrays, ink wells, vases, paperweights, punch bowls – even stained glass windows! Pipes were a favorite item for decoration, perhaps only exceeded in number and variety by the beer steins.